If you prefer, you can skip my introduction and hop on down the page to the hyaluronic serum that interests you and read more about how it can benefit your skin. Are you looking for the best hyaluronic acid serums for your skin? As we age, we need to be more discerning with our selection of beauty products, because we don’t want to waste our money on skin care products that don’t work. This is why adding a hyaluronic acid serum to your daily routine is such a great idea, because it is not only very affordable, but it helps to make your skin look more youthful and a soft, velvety feel. 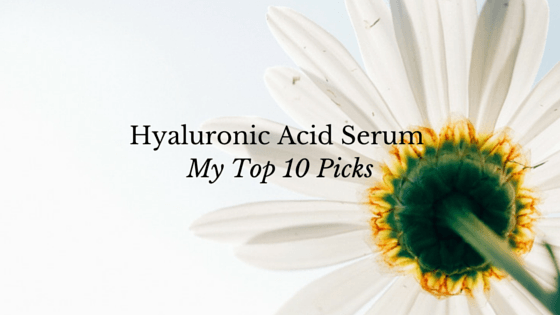 In this post I am going to introduce you to the best hyaluronic acid serums that will help you to rejuvenate your complexion and give you back a radiance you have been missing for so long. So if you are looking for the best anti-aging serum on the market, then you have come to the right place. My Top 10 ratings are heavily based on customer reviews, so if you think it is fabulous – then it is in my Top 10! → First because it delivers a super pulse of hydration deep into your tissues. → Second, because it promotes the growth of collagen in your tissues. The hydration, all on its own, helps to bring life and vitality back to tired, dry skin and gives your complexion a much healthier and fresher glow. On top of these effects, hyaluronic acid actually stimulates the production of collagen, returning suppleness and elasticity back to your skin. This happens because collagen needs to be bathed in a bath of nourishing fluid to work properly. The problem is that as we age, our skin loses its capacity to retain moisture and becomes drier, so the fluid bath that helps collagen to do its job, also dries out. This is one of the main reasons why we lose definition along our jawline and start to form wrinkles and fine lines – because collagen needs to be kept constantly hydrated to work properly. So a hyaluronic acid serum helps to make your skin look and feel more hydrated and at the same time, your skin looks more radiant and youthful, because the collagen is being stimulated to work as well. If you want the best anti-aging serum for you skin, then you can’t do better than including a hyaluronic acid serum in your daily skincare routine. 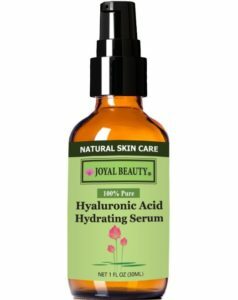 The Joyal beauty Hyaluronic Acid Serum deserves to be at the top of my list, because it contains a low molecular weight, vegan hyaluronic acid. The hyaluronic acid is derived from botanicals, not from animal sources and the low molecular weight of the hyaluronic acid means that this serum easily penetrates your skin to deliver a boost of hydration, right where it is needed. A low molecular weight hyaluronic acid is the best anti-aging serum for plumping your skin, adding more definition and giving your skin a super pulse of deep hydration. This serum is ideal for oily or sensitive skins, is free from parabens, sulfates and other nasty chemicals and is made in the USA. What do customers have to say about the Joyal Beauty hyaluronic acid serum? This is the fifth Joyal Beauty product that I am using and I am so pleased with it and no surprise! I have VERY dry skin and this was a god send. It’s helped me to fight my flaky skin. I now have no dry patches on my face which is hard for me to believe. Loved it! Seemed to plump my skin! 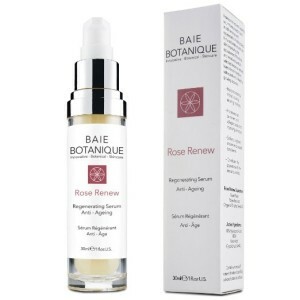 With a beautiful fragrance of roses, hyaluronic acid for super hydration, kojic acid, MSM and glycolic acid, as well as lots of antioxidants for cellular repair, the Baie Botanique Regenerating Serum is perfect for dry, dull or sun damaged skin. This serum is 98% natural, 80% organic and is suitable for vegans. It doesn’t contain parabens, propylene glycol, phthalates, synthetic colors or fragrances, sulfates or petrochemicals. Just one or two applications a day will leave your skin feeling, softer, cleaner and healthier than it has in a very long time. The best hyaluronic acid for heavily sun damaged skin that suffers from hyper-pigmentation (the kojic acid helps to lighten your skin). What do customers have to say about the Baie Botanique Regenerating Serum? I love this product is it makes my skin feel so much better than other products I’ve tried. I would recommend this but would also recommend the wash and moisturizer also. I have been using this serum twice a day, in the morning before applying my make up and in the evening before bed. I have noticed that my skin is feeling smoother and the tone is evening out. Happy Shopper, pleasant experience with the overall services & goods. Thanks!! This age defying formula includes hyaluronic acid, vitamin C and E, green tea, witch hazel, MSM, jojoba oil and geranium essential oil. This glorious combination of nourishing ingredients gives your skin an instant boost of moisture, minimizing fine lines and reducing damage caused by exposure to the sun. So those pesky age spots and sun spots are reduced, your complexion has a much more even tone and the texture of your skin is improved.. This wonderful Morea Naturals hyaluronic acid serum is free from parabens, is cruelty free, made in the USA and the hyaluronic acid is suitable for vegans. This is the best hyaluronic acid serum for skin that is heavily sun damaged or very dry and dull. The green tea (which is a super antioxidant) and MSM increase the suppleness, softness and flexibility of your skin. I felt an almost instant tightening and my skin was softer within days. Fine lines started diminishing within a week. I’ve noticed a correction to my skin tone being more even within the first couple of weeks. The Green Tea oil in the serum helped clear up my skin with no further breakouts ….my skin feels & looks healthier. This facial serum is chocked full of antioxidants and peptides to help you skin look fresher and brighter in days, rather than weeks. With 5% hyaluronic acid, vitamins C and E and MSM, you have a powerhouse serum that deserves to be included in your daily beauty routine. The Foxbrim hyaluronic serum is free from parabens, silicone, additives and fillers and is not tested on animals. Hyaluronic acid helps with cellular repair, delivers a boost of hydration to your skin and stimulates the production of collagen. The result is that your skin is more moisturized and plumper, giving your complexion a more youthful and healthier appearance. 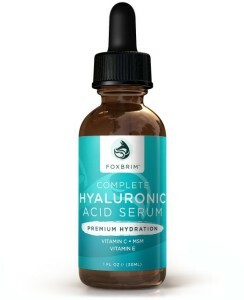 What do customers have to say about the Foxbrim Hyaluronic Acid Serum? I really liked this, It made my skin look and feel healthier and brighter! This stuff is fabulous! It really helps my skin retain its moisture and even in the warmer months,does a great job of keeping my skin looking and feeling even toned. I love every product from this company. This is the best hyaluronic acid i have ever used. Absorbs well, sits very good under makeup. With hyaluronic acid, lots of antioxidants and Matrixyl, this is a wonderful serum that delivers a punch of hydration and nourishment to your skin. Fine lines and wrinkles begin to fade, your skin has more definition and your complexion looks fresher and more youthful. The Adeline Hyaluronic Acid Serum is free from parabens, sodium lauryl sulfate, petrochemical and doesn’t have any added fragrances or fillers. It is made in the USA at a FDA inspected facility and you have a 100% money back guarantee. What do customers have to say about the Adeline Hyaluronic Acid Serum? I love this product. My skin looks fresh and blemish free. I won’t use anything else. 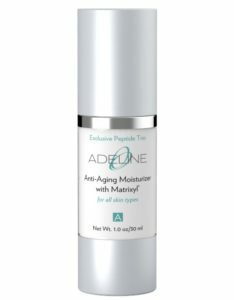 I hadn’t tried Adeline products until about a month or so ago and now I am a fan. READ MY FULL ADELINE REVIEW HERE. Containing 98% natural and 72% organic ingredients, the Azure Naturals hyaluronic acid serum deeply hydrates your skin, reduces fine lines and wrinkles and softens and smooths your skin. It doesn’t contain any parabens, or alcohol, is cruelty free and made in the USA. This serum is suitable for vegans, because the hyaluronic acid is sourced from botanicals, rather than animal products. It is suitable for all skin types and will not clog your pores. With lots of fabulous antioxidants, your skin looks cleaner, fresher and less sun damaged, and your skin is plumper and more youthful looking. I absolutely love it!. I’ve been using it for quite some time now. I bought this to put on age spots on my hands. I’m 70 years old and didn’t have much expectation that I would see any difference. I have used this serum for about 5 days and I definitely see that the age spots have faded. Amazing! I am 46 and get a lot of compliments on my skin since using this product. This is my second order, but not my last. This is one of the best hyaluronic acid serums that contains professional grade vegan hyaluronic acid with vitamin C and green tea. One of the reasons that this is in my Top 10 list is because the hyaluronic acid is naturally derived from plants, which is a huge bonus for vegetarians and vegans. The Body Merry Dew Serum contains lots of antioxidants and other nourishing ingredients, such as Aloe Vera and jojoba oil, witch hazel, MSM, geranium essential oil and vitamin E.
With this hyaluronic acid serum, your fine lines and wrinkles are minimized, signs of free radical damage, such as sun spots and age spots are reversed and collagen production is boosted. It does not contain parabens, fragrances, sulfates, phthalates or alcohol, is free from any skin irritants, made in the USA and is not tested on animals. 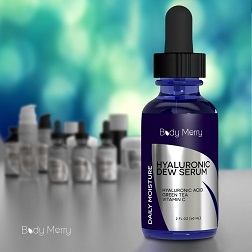 What do customers have to say about the Body Merry Hyaluronic Acid Serum? Already my skin looks healthier and has a shiny glow like it used to before age set in. I’ve been using this for about 6 months and my face looks and feels amazing. I will swear by Body Merry for the rest of my life. The Petunia Hyaluronic Acid Serum contains vitamin C, Ferulic acid and Neroli. So this serum is chock full of antioxidants and hydration boosters to give your skin a more youthful, glowing and healthy appearance. Your skin is more plumped up, tired dry skin is banished and any differences in pigmentation, due to free radical damage are minimized. This serum is paraben and alcohol free, has no sulfates, gluten or phthalates, is suitable for vegans, is not tested on animals, is cruelty free and made in the USA. This is the best hyaluronic acid for people who really need to focus in on cellular regeneration (neroli essential oil is perfect for this) and reversing the damage caused by too much exposure to the sun. 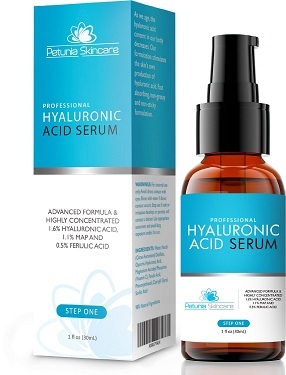 What do customers have to say about the Petunia Hyaluronic Acid Serum? This is my 2nd bottle. Feels so good on my face and neck. I actually look forward to putting this on my face. It really makes skin look more youthful and smooth. Very happy with my purchase. I saw my skin look healthier, more refreshed and moisturized with just a few days of use. I had friends and family notice how healthy my skin looked. READ MY PETUNIA PROFESSIONAL REVIEW. With 72% organic ingredients and lots of antioxidants and peptides, the JK hyaluronic acid serum is perfect for plumping, softening and defining your skin. The JK Hyaluronic Acid Serum does not contain parabens, petrochemicals, phthaltes and sulfates, and is cruelty free and made in the USA. So if you are seeing the first signs of sun damage on your skin or you have noticed that your skin is becoming dry, tired and dull looking, then the hyaluronic acid and antioxidants in this serum will rejuvenate your skin. 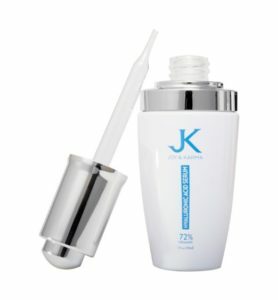 What do customers have to say about the JK Hyaluronic Acid Serum? This is a REALLY good product. My skin glows so well after applying it. It’s texture is smooth and just perfect. I have been using this product for a couple months and my skin appearance is really improved. This is a fabulous serum that provides both low and high molecular weight hyaluronic acid. The advantage of this is that the hyaluronic acid penetrates your skin even deeper and gives your skin a maximum, super boost of hydration. This is just about the only hyaluronic acid serum with both low and high molecular weight hyaluronic acid. VoilaVe is a 100% pure solution of vegan hyaluronic acid, so if you want serious hydration, then this is the serum for you! The VoilaVe Hyaluronic Acid Serum does not contain any fillers, parabens, fragrances or alcohol, it is suitable for vegans and is made in the USA. This is the best hyaluronic acid for seriously dry skin that needs a very deep pulse of hydration to being it back to life! 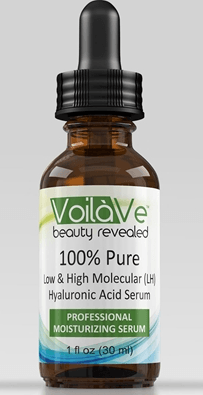 What do customers have to say about the VoilaVe Hyaluronic Acid Serum? This stuff is AMAZING. Seriously. AMAZING. Absolutely the best skin product I’ve ever purchased. I am 63 with fair skin. My skin feels smooth and hydrated and looks much, much better than before I started using this product.